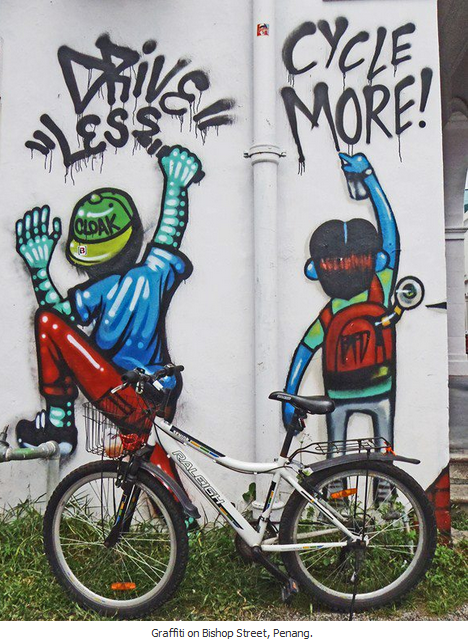 As we are seeing in these pages Penang in general and Georgetown in particular are giving serious attention to the possibility of creating a public bicycle system for the city. As a first step they have issued a Request for Proposals which is shortly to come online. This is a great thing because there are many reasons to create conditions for safe and agreeable cycling on city streets across the state. But as Penang moves ahead on this there is every reason to have a good understanding of how other cities have dealt with this challenge. And fortunately there is a rich trove of information on the topic which can be tapped. As someone who has been involved for more than a decade in studying and providing counsel on PBS system planning has dealt with have dealt with in Europe, North America and Asia, and who has used public bicycles on a daily basis since 1977, I feel strongly in favor of anything that advances the cycling agenda anywhere in the State. But to have a safe and well-functioning shared bicycle system, we need to have the preconditions of infrastructure for safe cycling which are the necessary first steps in this process. In the following film by our friends at Street films and the ITDP, we see some convincing examples of how successful cities are laying be for their shared systems. Let’s hear what they have to say that we might learn from. Without a doubt, 2013 has been a banner year for bike-share in the United States. Major systems were implemented in New York City and Chicago, and many others debuted or expanded in other cities. In fact, Citi Bike users have biked over 10 million miles and the system is closing in on 100,000 annual members! The Institute for Transportation & Development Policy (ITDP) has been studying 25 bike-share systems throughout the world, analyzing which ones perform the best and why. That informed ITDP’s Bike Share Planning Guide, which has copious data and fascinating charts to pour over, helping cities create bike-share systems that will thrive. Streetfilms.org produces short films showing how smart transportation design and policy can result in better places to live, work and play. Founded in 2006, Streetfilms has become the go-to organization for educational films about sustainable transportation, and inspires action and behavioral change worldwide. Individuals, public agencies, non-profit organizations, schools, and transportation advocacy groups use Streetfilms to educate decision makers and make change for livable streets in their communities. The Institute for Transportation and Development Policy – ITDP aims to deliver a higher standard of living and quality of life for citizens of cities around the world. Through our transportation projects, we work to reduce human impact on natural resources and ecosystems, and to ensure that we develop in a way that benefits us all, both today and in the future. Our vision of sustainable cities is one in which there is a high concentration of people living in an environment that is pleasant and provides good social infrastructure through good physical infrastructure. Cities where people are put before cars, and residents, workers and visitors young and old, can safely walk or cycle to their daily activities. Cities where jobs and services are a bus ride away, and the time and money spent driving can be used productively elsewhere. These are the kinds of cities that are attractive to us today – cities with less congestion, less pollution, fewer accidents, and healthier, safer, more productive communities. To achieve this, there are 8 principles which guide our approach to sustainable transport and development. This entry was posted in 2013, Cycling, Planning, Shared transport/streets, Video and tagged 2013, City cycling, Strategy, Vision. Bookmark the permalink.